Say what you want about the Transformers movies, and we all have, but there’s no denying they deliver spectacle on a level unto themselves. That trend looks like it’ll continue with the fifth film, Transformers: The Last Knight. 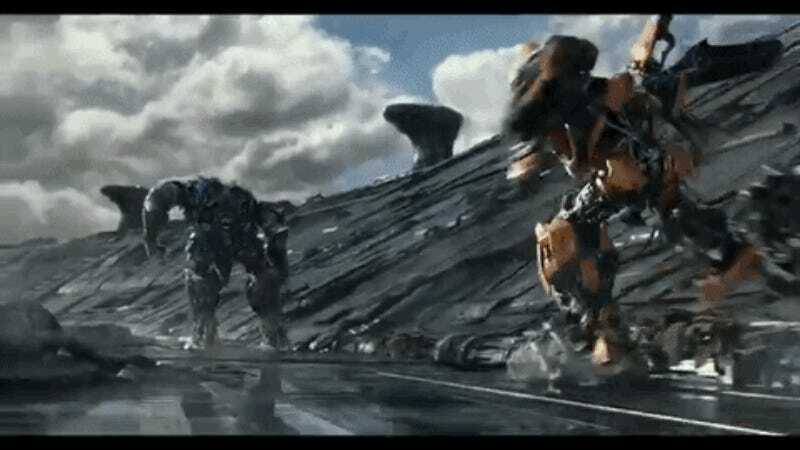 Once again directed by Michael Bay, The Last Knight is kind of a soft reboot on the franchise, which ended the last film with a new star (Mark Wahlberg) and Optimus Prime heading off on a mission to his old planet of Cybertron. What happens next? Here’s the insane first trailer to give you a taste. Yup, that’s a Michael Bay Transformers movie all right. As you’ll learn in my set visit report, The Last Knight is a “deep dive” into the mythology of Transformers. It’ll feature two storylines from two different timelines through the robot mythology running concurrently and converging at the end. They’ll explore how and why the Transformers split into factions, and have a historical context on Earth as well. Basically, things are just bigger than ever. What you can’t tell from the trailer is if Transformers: The Last Knight will continue the trend of the series mostly being all spectacle and no spark. The first film had a serviceable amount of character, emotion, and wonder in it but since then, each film has failed to reach that standard. The Last Knight could, but we’ll have to wait until June 23 to find out.